FARMHOUSE in the Syracuse area with pool and air-conditioned rooms. A few kilometers from Syracuse and the sea. L ' Farmhouse Le Chiuse is located in Syracuse Closed Farm is located in the province of Siracusa, one of the most interesting and characteristic areas of Sicily: in a natural environment, The Locks is a modern Farm Syracuse set in a building recently renovated rural, consisting of a manor house that overlooks a courtyard, the sides of which rise housing for all 'farm with treatment Bed and breakfast . Every room is equipped with every comfort to ensure that guests of Siracusa you feel at home, comfortable and in the absence of anything. 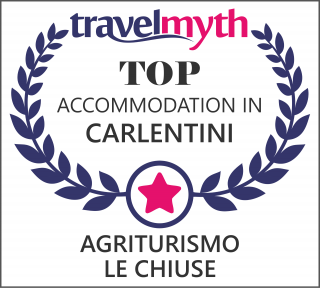 Each room of the ' Farm Syracuse is furnished with a style that recalls the traditions of the past, and each one takes a name characteristic of the ancient mythology of Syracuse. The service offered to all guests of the farmhouse goes from breakfast, served buffet style in the dining room restaurant, up to the room maid service every day and the ability to access the Internet through wifi available in public areas of the ' Farm syracuse . Farmhouse in Syracuse in Sicily, among rich citrus orange and lemon of Syracuse, to visit the Sicily by staying in farmhouse , enjoying the pleasure of the Sicilian countryside and large pool. Surrounded by green citrus fruits of Sicily. In the province of Siracusa, a few kilometers from the center of Siracusa, along the road leading to Carlentini, in the Val di Noto , in eastern Sicily, the Farmhouse Le Chiuse is located in an excellent position to visit the main tourist destinations of eastern Sicily, & egrave; You can book tickets for the performances of the Syracuse greek theater that annually hosts classical performances. Important directors and actors enact fact the ancient Greek tragedies, playing the wonderful show given by the natural scenery enhanced by the scenery of the most important contemporary artists. Syracuse & egrave; Also renowned for its sea, the beaches of Fontane Bianche, Arenella, marine oasis of Plemmirio, the natural oasis of Vendicari, are all jewels that make Syracuse one of the most sought after holiday destinations. Choose the country's closed to spend their holidays in Syracuse & egrave; a way to rejoice together in the pleasure of the visit and relax while enjoying the pleasure of the Sicilian countryside, the flavors of the cuisine of Sicily, his campaign products. Lemon verdello of Syracuse , one of the jewels of our production, oranges Sicilian tarot . The farm offers air-conditioned rooms, swimming pool, small children's playground. This site uses technical and third-party cookies. Continuing the visit, you accept their use. Click here to take vision.